Walter Krueger was born in East Prussia to a former German Army captain who died when the youngster was four years old. His family emigrated to the United States four years later, and Krueger's mother remarried a strict Lutheran minister who drilled him in mathematics, languages, and classics at home while he simultaneously attended the local public school. He abandoned his plans to enter a college engineering program and instead enlisted in the Army in April 1898. He fought in the Spanish-American war, rising to the rank of sergeant, and was commissioned in 1901 for his part in taking the barrio of San Juan de Guimba. He graduated from the Infantry and Cavalry School in 1906 and the Command and General Staff School in 1907. He participated in Pershing’s expedition in Mexico. In 1916 he briefly served as lieutenant colonel with the National Guard on the Mexican border before returning to the Regular Army as a captain. During World War I he held staff assignments in France. Between the wars, he continued to receive important assignments, and graduated from the Army and Navy War Colleges. The outbreak of the war found Krueger in command of 3 Army as an acting lieutenant general, where he had achieved a notable "victory" in the Louisiana Maneuvers. On 18 February 1943 he assumed command of 6 Army in Australia. As such he should have been under the command of Thomas Blamey, who was the nominal Allied land forces commander in the theater. However, MacArthur, who seems to have despised all things Australian, including Blamey, got around this by designating 6 Army as Task Force Alamo, thus putting Krueger under his direct command. Task Force Alamo fought all the way from New Britain to the Philippines. Krueger was an able linguist and military historian as well as an excellent planner and trainer of troops. None of his colleagues doubted his intelligence and capacity for hard work, though one observed that "he didn't have much of a personality" (Frank 1999). However, he was not an outstanding field commander, in spite of having commanded almost every echelon from squad to field army. Krueger himself had "about concluded that being practically sixty-two I would be thought too old for active overseas service" (Zedric 1995). The conduct of his campaigns suggests that he was too often out of touch with the real situation in the field, particularly at Biak, where his orders made no sense given the tactical realities. After one operation he received to a report of high officer casualties with approval, believing this was proof the junior officers were leading as they should. This likely reflected Krueger's tendency to identify more with the enlisted men than with his fellow officers. Paradoxically, his fellow officers considered him excessively slow and cautious. However, MacArthur rewarded loyalty with loyalty, and Krueger was loyal to MacArthur, showing no interest in publicity for himself. 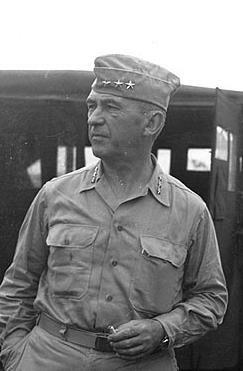 It was not until the Leyte campaign that Krueger directly commanded his army in combat, and MacArthur was so dissatisfied with his performance that he considered relieving him. It was probably Marshall's patronage that saved Krueger's career.